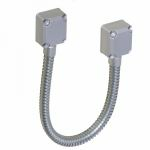 Deedlock supply us with a diverse range of high quality door loops that are required when an electric door lock has been installed and protection for a cable is needed. Our door loops allow the power connection to be transferred across the door frame and the door. As well as the standard surface mounting door loops we can also offer you concealed door loops that are seen as a more traditional and stylish solution while still offer a good level of security. 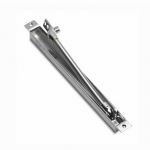 Our competitively priced door loops can be installed on single or double doors and they feature a long lasting finish that suits any door design.